Lagos, 14 October 2017 – The Tony Elumelu Foundation (TEF) today signed a Memorandum of Understanding (MOU) with the Agence Française de Développement (AFD), the French bilateral development agency, to further promote youth entrepreneurship in Africa. The principal objective is to [implement/develop] a risk-sharing guarantee framework granted by the AFD to commercial banks for loans to young entrepreneurs, empowered by the Tony Elumelu Foundation Entrepreneurship Programme. 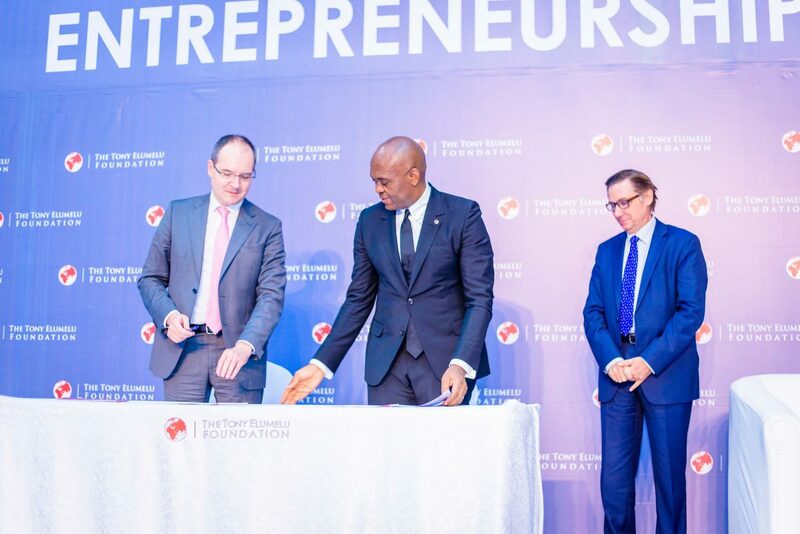 The partnership was signed by the Founder of The Tony Elumelu Foundation, Tony O. Elumelu, CON and the AFD Nigeria Country Director, Olivier Delefosse, in the presence of the French Ambassador to Nigeria, His Excellency, Denys Gauer, on October 14, 2017, the final day of the 2017 TEF Entrepreneurship Forum – the largest annual gathering of African entrepreneurs and the full African entrepreneurship ecosystem – which was held in Lagos, Nigeria on the 13th and 14thOctober. TEF and the AFD have agreed to jointly multiply the impact of their operations to promote youth entrepreneurship in Africa, with the objective of creating sustainable employment, economic growth and prosperity. The partnership also will also sponsor joint research studies and publications on youth entrepreneurship in Africa, with a focus on the digital and agricultural sectors, to develop insights that will influence policy formation and the business environment in Africa. The AFD will promote the TEF mentorship programme within its network, to encourage volunteers for mentoring young entrepreneurs empowered by the TEF Entrepreneurship Programme. Speaking at the signing ceremony, Tony Elumelu said: “The future of Africa lies in the potential of the private sector to drive sustainable development, fuelled particularly by small and medium business (SMEs). If SMEs succeed, the African economy will do well; but they need financial support that is tailored specifically to their needs. This partnership with the AFD is an important step in the right direction, as it will provide thousands of African entrepreneurs with further support to access to finance needed to scale up their businesses”.